Life Rebooted – Someone turned up the sun! Life Rebooted – Someone turned up the sun! Someone turned up the sun! 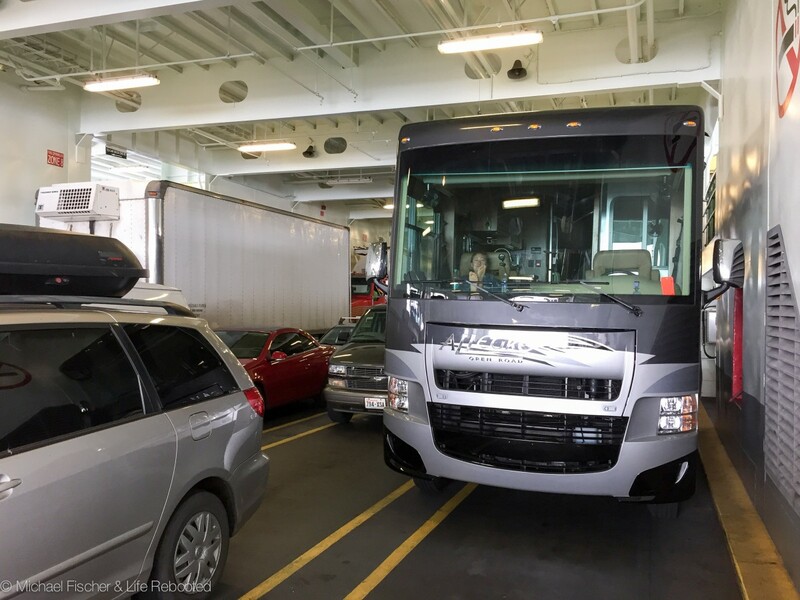 We decided to try the Kingston-Edmonds ferry to get from the Port Angeles area to Seattle. It would save us 50 miles of driving, although any gas savings is more than canceled by the ferry cost. Still, we thought it would be something fun and different to try, and it would break up the long drive. We unhitched Red before we got into the ferry line since it’s cheaper to pay for an RV and car separately than a 60-foot combination. They filled up the cars in the front, put the oversize vehicles in the middle edges, then piled the remaining cars behind us. We enjoyed a scenic 30-minute ride across the Puget Sound while eating lunch inside Rover, disembarked, and continued on our way. Our plan has always been to follow the sun while traveling around the US. In general our route has served us well (winter in Tucson was wonderful!) but we arrived in Seattle and Spokane in the middle of a freak Pacific Northwest heatwave. Seattle was another “visit old friends” stop for us. We always enjoy visiting long-lost friends, catching up, and getting much needed social interaction. While deciding where to meet, one friend mentioned they had air conditioning at their house if we wanted to meet there. I responded that we had AC too, we’re civilized like that. I figured he was implying that since we live in an RV we wouldn’t have amenities like AC but he laughingly responded that most folks in Seattle (unlike the mid-Atlantic) don’t have AC due to the cooler summer weather. Sometimes I forget that not every state does things the way I’m used to. When we went to the movies near Seattle, the ticket taker mentioned the heat outside and stated at least the theater had AC. If our friend hadn’t mentioned that fact earlier, I would have thought that was a very odd statement! I think this week’s heat changed a lot of minds about AC though—we saw a large number of people at Costco leaving with portable AC units, fans, and window AC units. Our Seattle stay started out with nice mid-80s weather but continually crept up to hit the mid-90s. 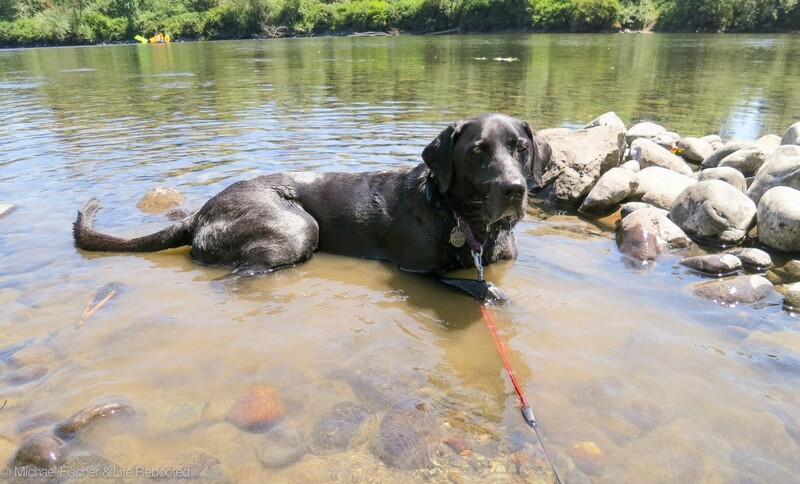 Fortunately we were camped right next to the Tolt river, making it easy for the dogs to cool down. 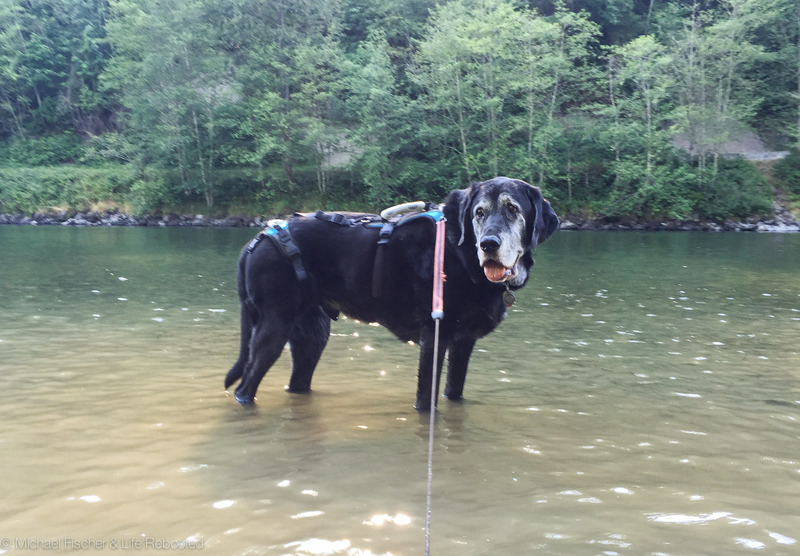 Max enjoyed getting his feet and belly wet while Opie went full in and stayed damp for the entire week. 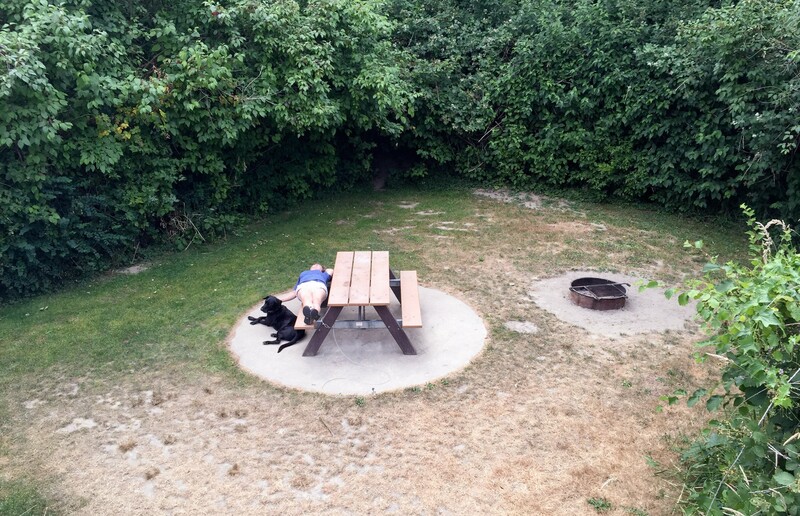 We really loved the Tolt-MacDonald campground, it’s one of our favorites for 2015 so far. The sites are pull-offs along a giant loop, so you have neighbors in front and behind but complete privacy on the camping side. The surrounding foliage provided shade and the camping space was large enough to treat as a backyard to play ball, relax, and soak up the sun. 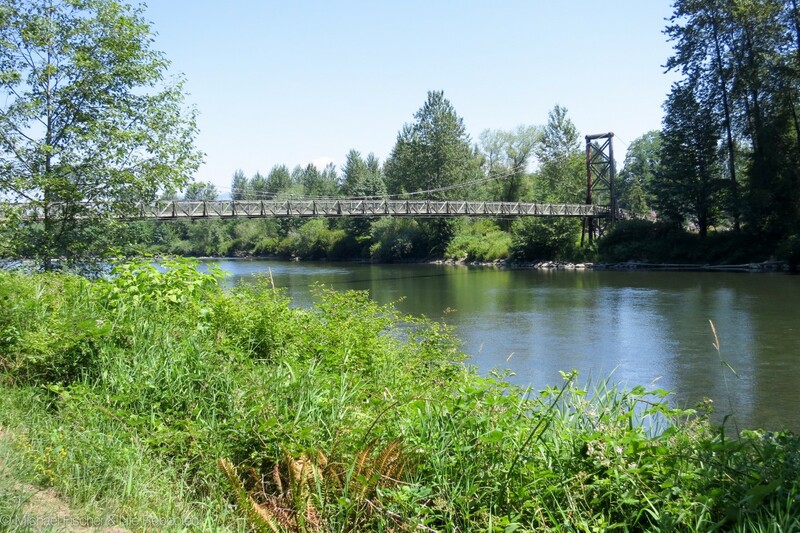 The Tolt River goes right through the park with lots of access points. During our stay, we saw many people (and dogs) taking advantage of the water (soaking, swimming, tubing, paddle boating). 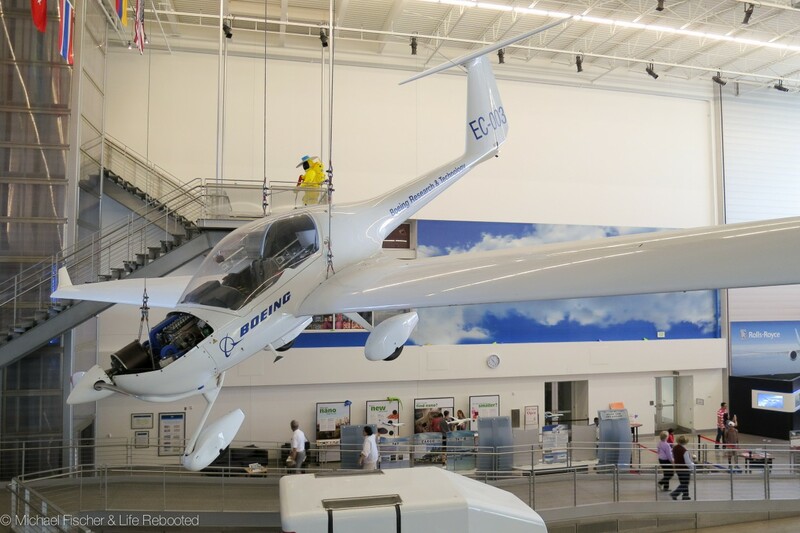 While in Seattle, we checked out the Boeing factory tour in Everett, WA. They start with a brief video, then take you above the factory floor to see the planes being built. We got to see the 777, 747, and Dreamliner in various stages of completion. It’s a bit geeky but fun to see. The total tour is about 90 minutes with some walking involved. No photographs are allowed inside the factory though. It’s amazing how the environment changes between western and eastern Washington. Seattle is lush, green, and full of trees; however once we crossed the Cascades heading to Spokane, it turns into a desert with lots of brown and beige. 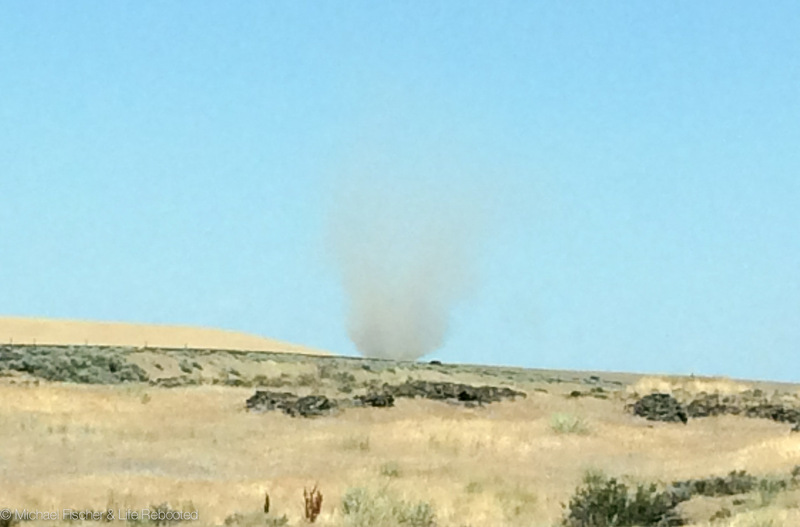 Rover hit a lot of crosswinds on our way to Spokane and we saw quite a few whirling dervishes (or dust devils), which look really cool but are mostly harmless. 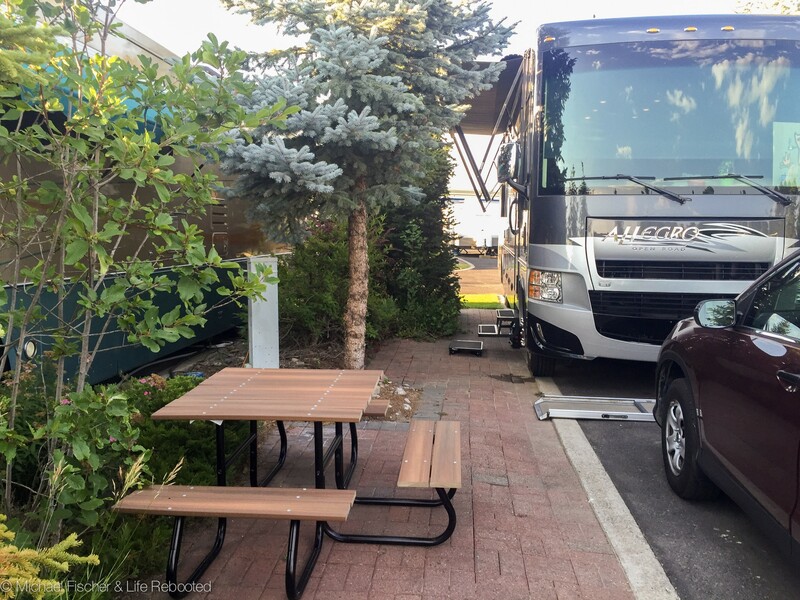 Our wonderful campground in Seattle made it tough to adjust to our spot in Spokane. This was our backup spot since all the campgrounds near Couer D’Alene were full for the July 4th holiday weekend. 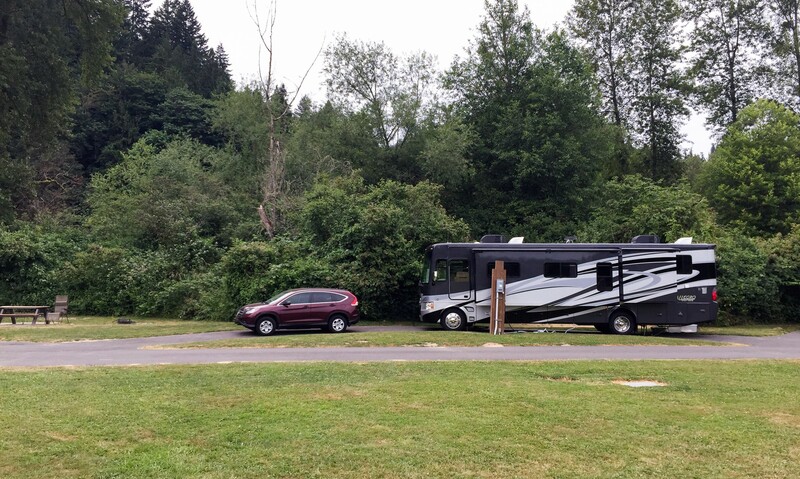 While the landscape was pretty, the employees friendly, and the roads smooth, the sites were so close together we had almost no camping space and working on the hookups (electric, water, sewer) meant hunching over and crab-walking to get to the wet bay area. (In case I’m being too subtle, I did not like our site). Since we were only here for the holiday weekend and our next stop would be much better, we used the time to replenish supplies, do lots and lots (and lots) of laundry, and try to stay as cool as possible. With temps soaring above 100 degrees, we had to be really careful that the dogs didn’t overheat. We took them out early in the morning for a walk, a fast pee break at 4, but their evening walk had to wait until 8pm when the temperature dropped to 85 degrees and the asphalt wasn’t so hot (tip: put the back of your hand on the pavement. If you cannot hold it there for five seconds, it is too hot to walk your dog). Even with those precautions, poor Max was huffing as if he had just finished chain-smoking three packs of cigarettes. With our shades down and the AC running constantly, we were at least able to keep Rover cool enough to keep Max comfortable indoors. Needless to say, neither of them spent much time outdoors this weekend. Being so far north, we’re still adjusting to the amount of sunlight we get everyday. The sky is light at 5AM, and the sun sets after 9PM. It doesn’t get even dark until 10PM, which means we’ve subconsciously moved our day further back – later dog walks, dinner, and staying up later. That’s not necessarily a bad thing unless we want to sleep in and forget to close our bedroom shades. I’m certainly not complaining! Following the sun means enjoying the warmth and long days of the north during the summer, and enjoying the warmth and long days of the south during the winter! Looks like a good spot to be camped in when it’s hot. Doggies look happy to be in the water. Same with our dog, Hurley doesn’t do as well with heat as he did when he was younger. And he’s only 6. Hopefully it will get cooler for you as you cross into Idaho? We’re in SE Idaho now until the end of the month. It’s a bit warmer for us and definitely lighter, longer as we came from CA. Not to mention the time change. Hi Debbie! Hopefully you’re staying cooler in Idaho. Unfortunately we had to bypass Idaho this year, so we’re currently in Montana and the weather has definitely cooled off. It was weird going from 105 in Spokane to 80 in Montana the very next day. Hope Hurley is staying cool too. It’s tough seeing our pooches suffer from the heat, isn’t it? You mentioned staying in CA back “home” for a while. Hope it was lots of fun! The long sunny summer days are a welcome to me up here in Michigan. I suffer from seasonal disorder. When the days get shorter and shorter, and we lose bright sunny days for the overcast, shorter days of winter here, my internal batteries run down. No energy, no enthusiasm, no ‘go’. By February, I feel like an uncharged cellphone whose battery is about shot. This time of year, I am outdoors more then in! Gardening, mowing grass, playing outside with Buddy, our 6 year old chocolate lab, kayaking, golfing. Summers in Michigan are great!!! I can totally understand loving the longer days. It’s great, just very odd for us since this is the first time we’ve experienced it. I love the sun, so I have the winter blues too but I like your cellphone analogy! With such short winter days, I can understand why so many folks in northern states are outdoorsy in the summer!